I've been using Qnet for a while now. 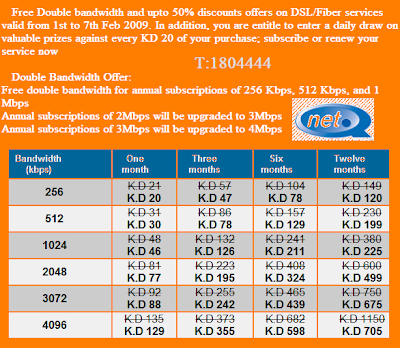 My DSL subscription will end this month. I didn't decide yet whether to renew with qnet or not! Recently I made a comparison between Qnet and other Internet Service Providers. I noticed that there is a big difference in term of price/speed between Qent and the other ISP's. but I am not sure about the quality/connection reliability of their service! If You are a fasttelco or KEMS user, I need some reviews..! What is your ISP? Do you recommend it or not? and why :) ?? Don't miss the 7 days offer from Fasttelco, KEMS, and Qnet. I use WNET USB device and the speed is crappy I cant have a DSL at home as they have stopped giving new telephone lines in my area! our house has FastTelco for a few years now, their customer service is great, and i think its open 24 hours too. They havn't complained about it as far as i know... oh and you get a free wireless router too. and yes i've been with quality net for like 8 years .. hard to change! Well at my home desktop i use Global Direct, that one is mainly for downloading stuff thru torrents (basically its downloading 24/7). I guess it's been over 6months now and the service is pretty much stable from what i've seen. i pay 50kd a month, although i must confess for some reason i cant remember if its 1mb or 2mb ... basically the DL speed peaks at 200 kb/s with torrents that have good connections.. which is good enough in my books. when im around and about i use Wnet. well their service is crappy, but since i only use it for light usage and the occasional download its not so bad. 30kd for that one. Argh, I pay less than 50KD per year for a 16MB Broadband connection in London. 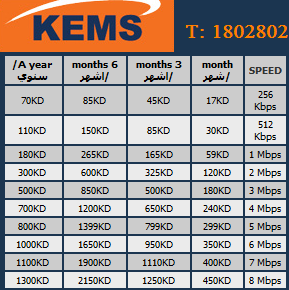 Kuwait Internet is expensive for "not so good" services. 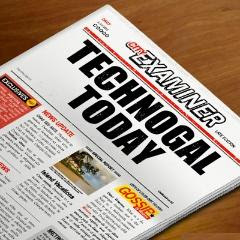 Thank for the info guys :) appreciated. so? which one did you decide on in the end? Qnet of course :) they have good offers ending today. besides, I've been using Qnet for years now and so far no problems with them. also their price for the 2MB is quite reasonable. and it says: "Khalik 3la maynonik la eyeek elee ayan minah"!!!! !